I recently reviewed writer/producer/director Garry Marshall's new book My Happy Days in Hollywood. Click HERE to see that review again. His reminiscences on his work in television sent me to seek out Christmas episodes from some of his past series. Many of these Christmas episodes are some of my personal favorites--episodes I love to watch over and over again. 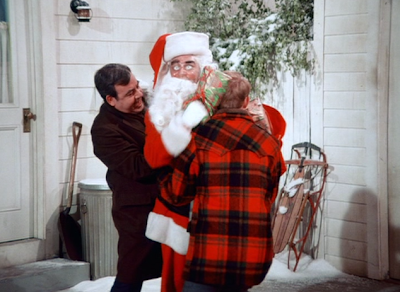 This touching Christmas episode of Happy Days is certainly a fan favorite and one readers often ask me to share. How long has it been since you've last seen this episode? Happy Days originally ran on TV from 1974 through 1984. This second season holiday story "Guess Who's Coming to Christmas" is the first of many Happy Days yuletide episodes. The episode begins with father Howard Cunningham insisting that this year's Christmas will be a traditional event for family members only. The gang meet at Arnold's to exchange gifts. 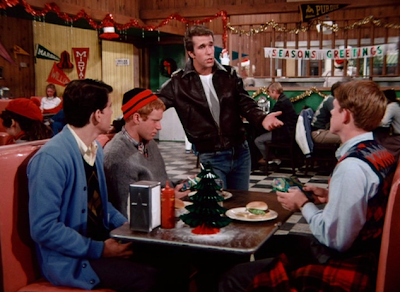 At Arnold's diner, Potsie, Ralph and Richie are happy to see that the Fonz is in high spirits for Christmas. 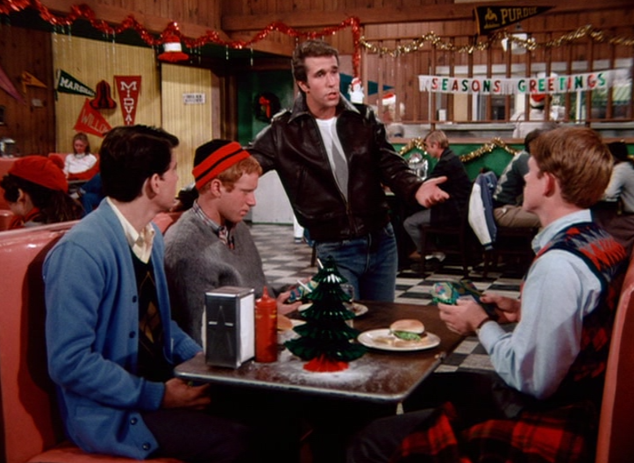 Fonzie is there to hand out gifts for the waitresses and each of his friends. When asked about his holiday plans, Fonzie claims he's looking forward to a large celebration with his family just outside of Milwaukee. Richie walks in on Fonzie eating ravioli from a can, alone on Christmas Eve. 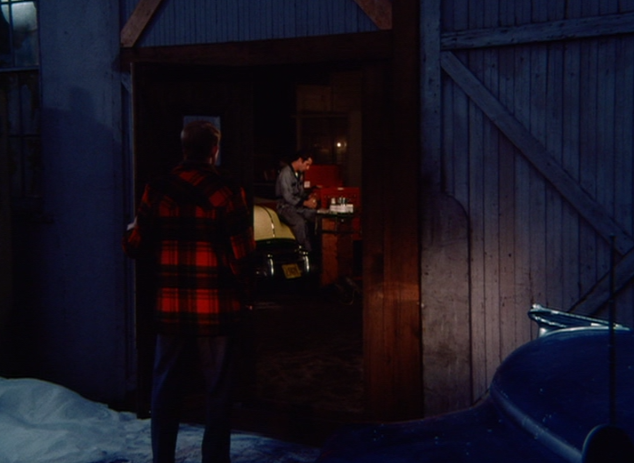 On Christmas Eve, Howard and Richie have car trouble and ask for Fonzie's help. The Fonz fixes the Cunningham's car but then insists that he has to close the garage and catch a bus to join his own family for Christmas. But when Richie returns a few moments later to give Fonzie a Christmas gift, he finds the car mechanic sitting alone, eating food from a can. Clearly, Fonzie doesn't really have anywhere else to go on Christmas Eve. Awkwardly, Fonzie insists he has to catch a bus to join his family for Christmas. 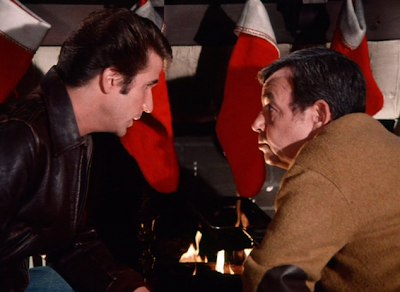 Despite Howard's plans for a traditional Christmas, the rest of the Cunningham family insists Richie go back and invite Fonzie to come over on Christmas Eve. Oldest sibling Chuck is home for Christmas! When Howard and Richie return to knock on Fonzie's door, the loner still insists that he has plans for Christmas. 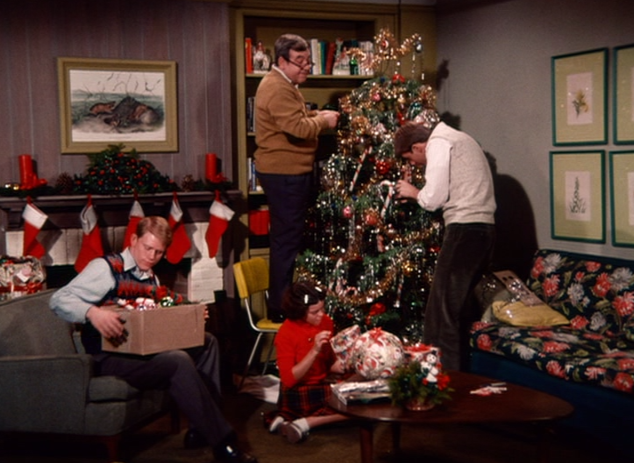 Not wanting to embarrass their friend, Howard and Richie plead with Fonzie to come to the house in order to help them repair the broken mechanical Santa Claus they have in the front yard. The robotic Santa Claus that pulls a gift from the bag over his shoulder swings wildly out of control, striking Richie in the head over and over! Fonzie repairs the Santa Claus as well as the Christmas tree lights. However the hour is late and Fonzie has missed the last bus out of Milwaukee. Now he's obliged to stay at the Cunningham home for the evening. Joining the family in their traditional celebration, Fonzie happily pops popcorn and even offers to read the poem 'Twas the Night Before Christmas' out loud for everyone. 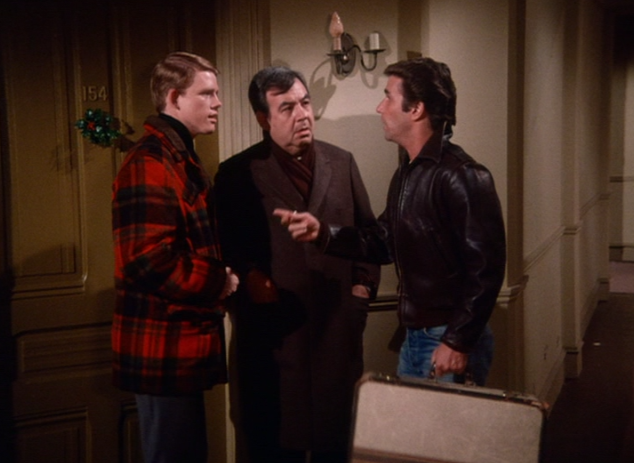 It's touching that the Fonz may not have felt comfortable asking to be included in the Cunningham home on Christmas Eve--perhaps he didn't want to feel like a charity case or to be pitied for being alone. However, Howard and Richie were sensitive enough to see this and allow their friend to join their family celebration on his own terms. Aware that Howard knows about his ruse, Fonzie leans into the fireplace next to Howard and thanks him. This episode tells its emotional story just right--the sitcom's laugh track is minimized and Fonzie is doing his best to maintain his dignity even if he's alone on Christmas Eve. It's sweet and tender without stepping over into saccharine territory. 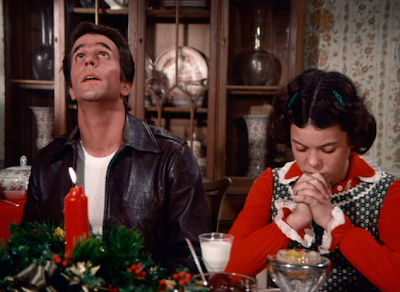 Talk about traditional--the Cunninghams asks Fonzie to say grace before their Christmas dinner. Fonzie simply states "Hey God--thanks!" This is a Christmas story that has several layers of nostalgia to experience. It is a story set in the 1950s (told in the 1970s) reflecting back onto what seems like simpler times with emotional highs. Now watching it in the 21st century, it allows some of us to feel sentimental about our own 1970s experiences (and our cultural reflections of the 1950s). Christmas is certainly one time of year that we indulge ourselves in feeling good about our pasts and our childhoods. I too can't help but feel nostalgic for Happy Days--and my own happy days--of the 1970s and its Christmases. What about you? No mention that that mechanical Santa Claus is one of the most terrifying things ever aired on television? LOL!! Actually, a robotic Santa that goes out of control has been repeated several times in Christmas TV episodes--from the 1976 episode of 'Are You Being Served?' to 1991 episode of 'Home Improvement'to 1996's 'Kenan & Kel' as well as several animated evil robot Santas: Futurama, Invader Zim, My Life as a Teenage Robot, and Batman: Brave and Bold." Any others anybody knows of? I think this particular one is extra scary because it's obviously a man in a suit dressed as a soulless white eyed Santa robot. There was a robot "boy" in "Silent Night, Deadly Night" Part 5 The Toymaker I believe, but I don't think we ever got a Robot Santa. Nice recall. Love Mickey Rooney in that movie. How true that it is a picture of the 50's from the 70's perspective and we are watching it today from a whole other century, in that Happy Days is unique. I remember crying as a kid when this aired for the first time and it has remained one of my favorite of all the Happy Days episodes. 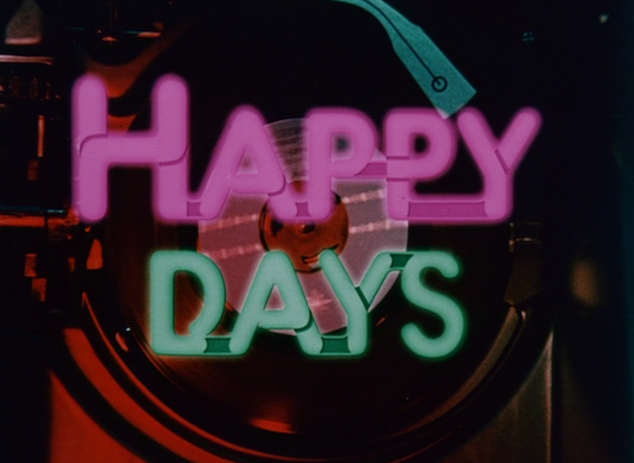 May very well be the single best Happy Days episode. I am a teacher at a public middle school in Ohio. For the past 5-10 years, I always show this episode on the last day before break as my "gift" to the kids. I ask the kids at the end what they think was wrong with Fonzie. The obvious literal answer is of course that he has nowhere to go for Christmas. After they think about it, they realize that he is just too proud to accept the hospitality of others...I try to let the kids know that being too proud to accept help from others takes away their chance to be a servant to you. We often want to help others (Like Fonzie did over and over again), but we forget that it's just as important to let others help us as it is for us to help others. I also enjoy the irony that my favorite Christmas special has someone Jewish as the lead character. I have always enjoyed Henry Winkler's work.